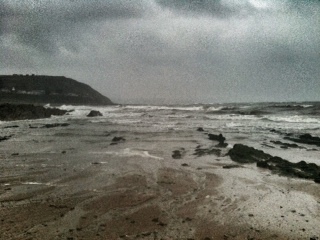 South East winds are making Myrtleville a little “textured” – as captured by Siobhan Russell at lunchtime yesterday. We swam Crosshaven to Camden this morning and it was flat calm for a perfect swim. With the winds forecast to stay SE, we will be swimming from Crosshaven for the rest of this week at 6.15am on Wednesday and Friday. Meeting at the slip past Centra and Castlepoint boatyard. Hopefully the forecast will hold and move back Northerly for Sunday’s swim. This entry was posted in Information, Swimming Times and tagged Myrtleville swim times, Myrtleville swimming, Open water swimming - Cork, Open water swimming - Cork - Ireland, Sea swimming - Cork, Sea Swimming - Cork - Ireland by myrtlevilleswimmers. Bookmark the permalink.